Penn State Health Milton S. Hershey Medical Center is celebrating National Doctors&apos; Day, an annual observance to recognize the contributions of physicians to the communities they serve. The first Doctors&apos; Day observance was on March 30, 1933 in Winder, Georgia, when Eudora Brown Almond, wife of Dr. Charles B. Almond, decided to set aside a day to honor physicians. It included the mailing of greeting cards and placing flowers on the graves of deceased doctors. 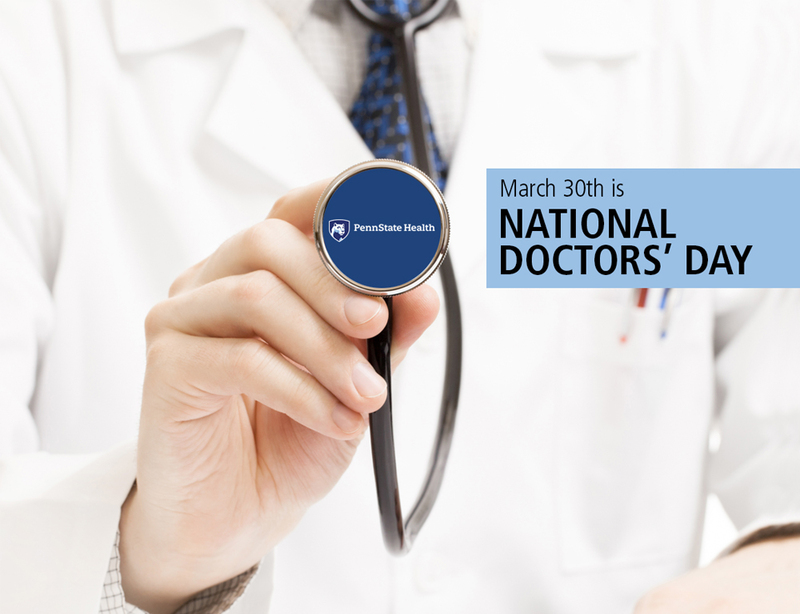 Since that time, legislation has been signed into law designating March 30 of each year as National Doctors&apos; Day. Thank you to an incredible team of doctors at Hershey Medical Center&apos;s NICU. The unending support and care that you provided our son and our family went above and beyond what we ever could have imagined. We can never thank you enough for everything you have done. From the bottom of our hearts, we appreciate each and every one of you! After a stroke, my 63-year-old husband needed a doctor to follow up and treat him going forward. Dr. [Susan] Borys was nice enough to offer her loving, professional care and expertise. We love her very much. I have been a longtime heart patient, but last year I was diagnosed with uterine cancer. I chose Hershey for my treatments, and I was scared. Cancer is something that other people get, not me. The caring doctors and nurses really made a difference in my life. Everything with my chemo treatments was explained to me, step by step, and if I needed to talk to someone, they were just a phone call away. Thank you all so much for being with me on this journey. I would like to thank Dr. John Field for his outstanding work and dedication in the field of cardiology. I feel so fortunate to have had the opportunity to work with him at the bedside and in the classroom. He is always available to share his knowledge and experiences, not for personal gain, but to empower those around him. Thank you, Dr. Field, for sharing your time, talents and passion over the years. This is to recognize and thank ALL of the amazing doctors and teachers at the Penn State College of Medicine. Our daughter Lia, who is beginning her third year as a med student, has been blessed with the most caring, compassionate, mentoring doctors from whom she has learned so much. We know she will become a wonderful patient-centric physician one day because of the outstanding role models she is blessed to work with each day. The hospital is lucky to have such fine doctors for their patients and their students. Read more of their reflections here.